The Autobarn is located in Linden, PA (Lycoming County) and specializes in quality pre-owned cars, trucks, and vans. Whatever you are looking for, the Autobarn has it! And, if they don’t have it, chances are they can find it! 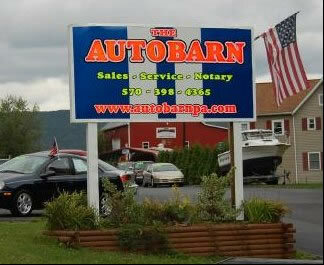 The Autobarn also has a service center and does PA State Inspections and Emission inspections as well. Stop in and see for yourself why the Autobarn is the area’s best place for quality pre-owned vehicles and friendly, knowledgeable service. Check out our Internet Special!